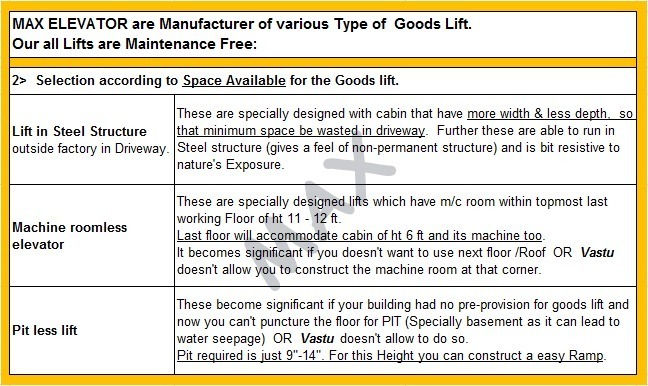 maxlift - Freight elevator Page in delhi , India as of 21-Apr-2019 . Food & Pharma:- Adani Ltd, Anmol Ltd, Ayur, Bambino Ltd, Avon India, Akums Ltd, Gharwhal Paneer, Kundan Care Ltd, Revlon India, Win Medicare Ltd, SR’s Merry Foods. Home Décor & Hospitality:- City Park Hotel, Magpie, Mittal International Ltd, Champo Carpets Ltd, IPSA, Sangam Ltd (Bhilwara), Sheena Exports Ltd, Vk Packwell Ltd, Body Care apparels Ltd. Jintan Worldwide, Grover international Ltd, Pooja international Ltd.
Paper / Packaging & Other industries:- BILT (Ballarpur Ind Ltd), ‘Lotus’ Stationery, ‘Neelgagan’ Stationery, Brijbasi Art Press Ltd, Akshardham Temple (Delhi), Alert India, Arkylite Electricals, Delhi Metro, DPS (R.K.Puram), Delite Furniture, Essel Group, Giriraj Foils Ltd, Indo Asian Fusegears Ltd, Kent Ind. Ltd, Seaga India, SAFEXpress Ltd, Somany Tiles, Victor Electrodes, Telemechanic Ltd, Toyzone Ltd, Waves Aircon Ltd.
New Delhi, NCR- Gurgaon, Faridabad, Noida, Sonipat, Panipat, Bhiwadi, Ghaziabad, Bhadurgarh. Agra, Allhabad, Aligarh, Amritsar, Baddi, Bulandshar, Bareilly, Bhilwara, Ballarpur ( Maharastra ), Dehradun, Haridwar, Jammu, Kanpur, Lucknow, Leh-J&K, Modinagar. Mathura, Nalagarh, Rohtak, Rudrapur, Rishikesh, Rorkee, Solan, Varanasi and many more--. © 2013 maxlift. All rights reserved.